But first, here is our (pre)launch trailer! The full name is "(I Fell in Love With) The Majesty of Colors" but you'll find it on storefronts as "The Majesty of Colors Remastered." We call it "The Majesty of Colors" for short. "The Majesty of Colors" is Gregory Avery-Weir's classic game about a strange being from beneath the waves who discovers colors for the first time when it comes to the surface. With a single tentacle, you choose how to interact with humans and they'll react with love or anger. Haven't I seen this game before? Yes! 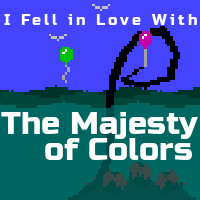 "The Majesty of Colors" was originally released in 2008 as a Flash game. The Remastered version uses the original art with improved sounds, visual effects, and physics to bring the game closer to its original vision. By re-coding the game from the ground up, we've made it available for desktop and mobile. Do I need Flash to play? No! The game has been remade almost from scratch in Unity. What desktop platforms will the game run on? We'll be releasing on Windows, OSX (Apple), and Linux. Yes! "The Majesty of Colors" will be on the App Store for iPhone and iPad and on Google Play for Android. Where can I get the desktop version? It will be available from Steam and itch.io. Each play session is short and leads to one of multiple endings depending on your actions. Unless you really take your time, you can find them all in under an hour. $2.99 or a close equivalent in your currency. I'm a streamer; can I have a copy? Yes, if you have enough subscribers! Get a key through Woovit and the game will unlock when it's released. If you are press and would like a prerelease key, please contact us at info@futureproofgames.com from an official email address. I have a question that isn't answered here! How do I get an answer?